Power. The struggles for power have flooded the news. Whether we look to the politicians in Washington, striking workers and management, or even within families and relationships, these struggle are seen. The grasping for power is seen as essential if we are to live with the intent of being in charge, being in control. Our culture is obsessed with this struggle. IF we stay in touch (especially through the pretense of electronic media), IF we keep on top of the information and knowledge we need..then we will have the power, we will be in charge of our lives. Sadly this struggle for power is pursued on the shifting, sandy myths of the world. Sadly our pursuit of power often neglects the most power-filled practice provided to humanity. Persevere in Prayer through Conflict: Our shared story of Moses in the Old Testament today clearly illustrates this reality. God had called the Israelites to the Promised Land. Then, as now, Satan’s intent was to deter and to rob God’s faithful from that promise. This battle is at the heart of the challenges of prayer. WHY is it so difficult? 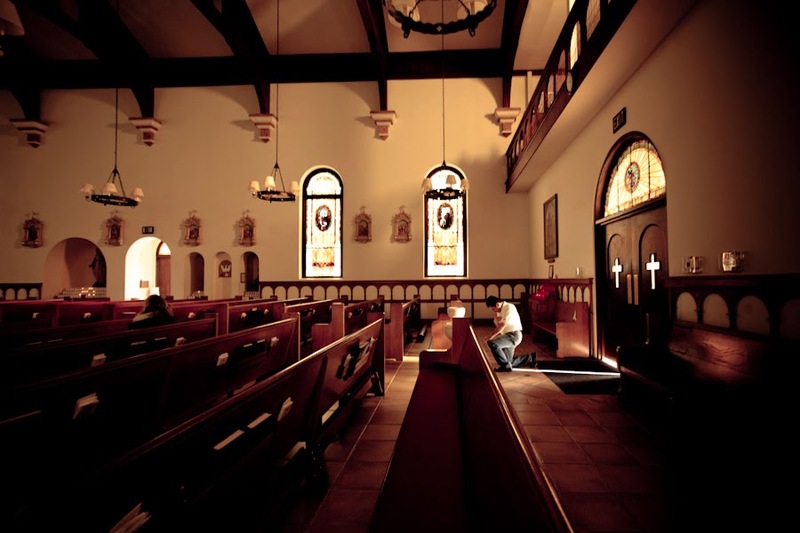 Why is it so hard to to come to Mass and then to truly enter into the prayer as opposed to just warming a pew? Why is it so hard to go to Adoration? Pray the Rosary? Pray the Stations of the Cross? Or to, in the most simple sense…to pray with perseverance? As Moses and the Israelites encountered, seeking the Kingdom of God is a battle. St. Paul, millennia later, would remind us : “we wrestle not against flesh and blood but against spiritual; wickedness in high places”. Persevering prayer is a call to battle. But it is only through the battle we come to victory. As Winston Churchill once said: ” if you are going through hell, keep going”. We must not stop praying. We must allow God to send us His help of His Spirit, His angels and saints that we may persevere. Persevere in Prayer through the Weariness. Our wine country is very popular for racing. Walking, running, bicycling all are disciplines popularly pursued through the hills and valleys of our land. The winners, those completing their race, must persevere. Why is this concept so difficult for those seeking God in prayer? Truth be told, prayer is often wearisome. It is, especially when real prayer is being done, WORK. This is complicated by the extra stuff we bring with us in prayer. We love ours distractions. The cyber-electronic obsession of many has not neglected prayer. A quick Google of “prayer Apps” brought….44,500,000 Apps in less than 20 seconds. Now some are possibly helpful. But are any of them necessary? Going back to the racers we see on our roadways, what would we think if we saw someone in a race carrying loads of baggage? We would think they are not to keen to finish the win. Yet how often do we come to a time of prayer burdened with trinkets and stuff in hand and soul, that distract us from the goal of persevering in prayer. The extra baggage only hastens the weariness that can deter us from completing the race. Let us allow the Holy Spirit to lift from our hearts and hands anything that hinders us in our prayers. Persevere to God. Jesus in the Gospel spoke of the woman who was frankly pestering the unjust judge until he responded to her plea. He closes the parable with a question. When the Son of Man comes, will He find faith on earth? When Christ comes in glory, or, when Christ calls us to the ultimate realization that we are not in control, and calls us home will He find faith in our hearts? God is not seeking a scoreboard of success. God is looking to see who prays the most rosaries or attends Mass most often. God is not looking to see how much Bible we have read or memorized. Those are all very good things to do. But we must remember…God is looking for …you. If we come to Him wounded, weary, scarred from conflict He will embrace us with His healing, cleansing grace. If we come having foolishly followed the prodigal, He will again hear and help us return to His feast. If only we could see it isn’t about power or control. It isn’t about the conflict or our weariness. It is about the majestic joy and love as we enter into His Presence. And though we realize it so late we understand that in persevering into His Presence we enter the most powerful and peaceful place in Heaven and earth.